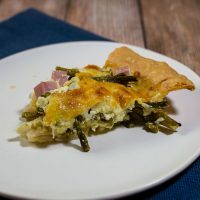 This ham, asparagus and gruyere quiche is ideal for brunch for a crowd: it should be made ahead, can be served at room temperature, and it’s delicious! It’s #BrunchWeek! I look forward every year to #BrunchWeek — brunch is one of my favorite meals! Whether we cook at home, or eat out, I love brunch. Our sponsors love brunch, too, and make sure you pop over to the sponsors and giveaway information post to see the great prizes you can win, and the entry form! My first recipe for this year’s BrunchWeek is a classic — quiche. It’s perfect for eat-at-home brunches, because it should be made ahead, and can be served at room temperature. And the flavor combinations are nearly endless! 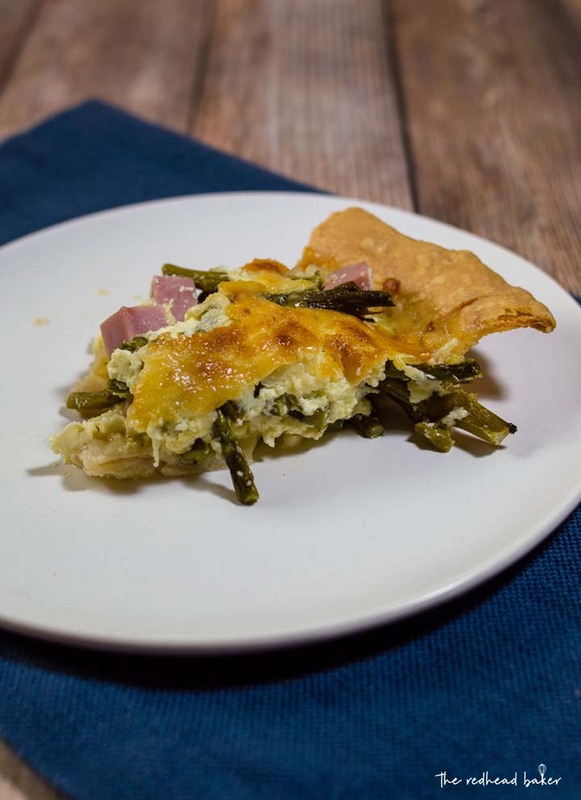 This one uses fresh Michigan asparagus, cubed ham, and gruyere cheese. Gruyere is a hard cow’s milk cheese from Switzerland. If you’ve ever had an authentic crock of French onion soup, gruyere is what’s traditionally melted over the top. 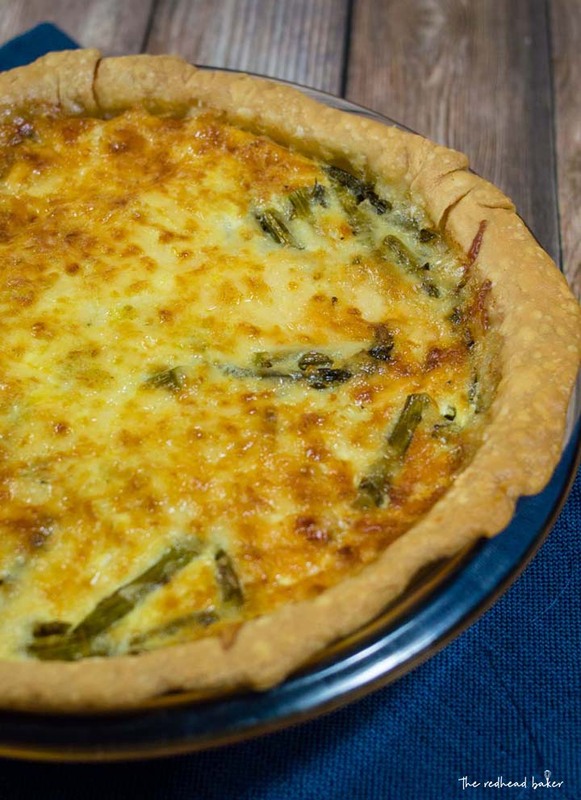 Its mildly nutty flavor adds savoriness to the quiche. 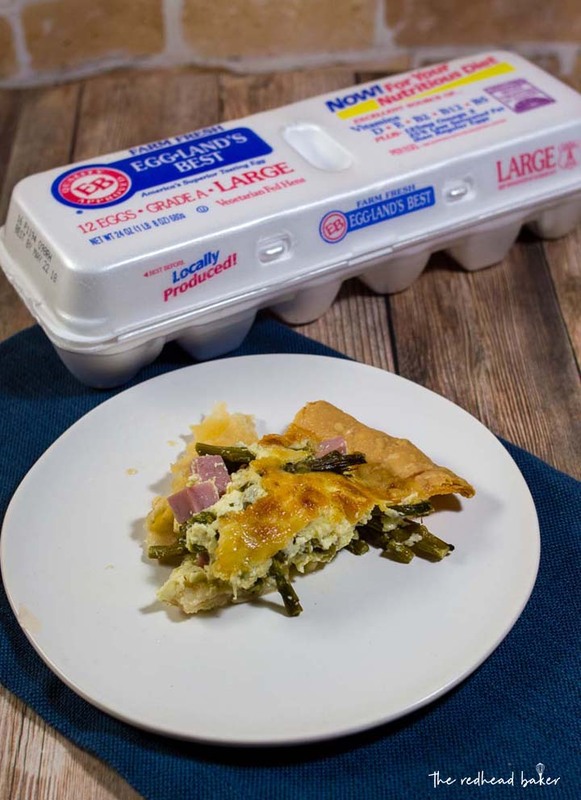 The egg base consists of Eggland’s Best eggs and half-and-half. Different sources will tell you different ratios, but I prefer 4 eggs to 1 1/4 cups half-and-half. Anything more than that will cause the mixture to run over the crust! And no matter the filling, I always add a pinch of nutmeg in addition to salt and pepper. Eggs need to cook low and slow, which isn’t enough to tenderize the asparagus, so it needs a quich saute in butter to soften before being added to the quiche. Try to drain off most of the butter before adding to the quiche, otherwise, it’ll throw off the liquid ratio and take longer to set the eggs. If you’re serving this gruyere quiche on the same day as baking, be sure to let it cool until just warm to the touch before slicing, otherwise, you’ll just have a runny mess. Otherwise, cool to room temperature then chill (covered in tinfoil) until ready to serve. Let it sit at room temperature for 30 minutes (or even let it sit for 15-ish minutes in a 250-degree oven to warm it) before serving. 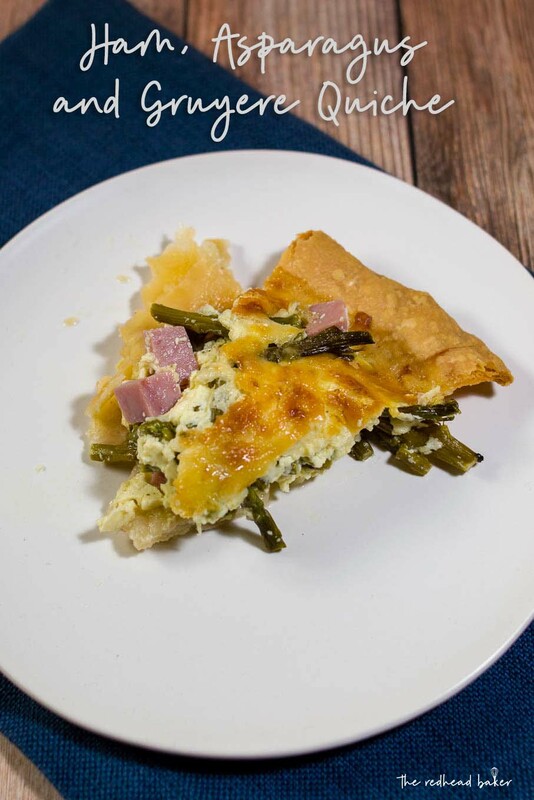 This ham, asparagus and gruyere quiche is ideal for brunch for a crowd: it should be made ahead, can be served at room temperature, and it's delicious! Place a baking sheet in the oven. Preheat oven to 350 degrees. Melt the butter in a large saucepan. Add the asparagus and saute for 5 minutes, season with salt and pepper. Remove from the heat and set aside. Lay the pie crust in a 9-inch pie plate, and trim the edges. Dock with a fork. In a bowl, toss together the ham, asparagus pieces, and gruyere cheese. Pour into the prepared pie crust. Wipe out the bowl. Add the eggs, half-and-half, and nutmeg; whisk to combine, season with salt and pepper. Pour into the pie crust. Carefully place the pie plate in the oven on the preheated baking sheet. Bake for 1 hour, or until the center of the quiche does not move when gently shaken. Cool on a wire rack until just warm, then slice and serve (or cool to room temperature, then cover with tinfoil and chill until ready to serve). Coconut Cream Pie Donuts from 4 Sons ‘R’ Us. A perfect, classic brunch dish. Great start to this week Coleen. Quiche are great for brunch, and Gruyere gives such a great flavor. Gruyere is one of my fave cheese for quiche. It’s deliciously sharp and perfect with the earthy flavor of the asparagus.